Picture of Henry Pickton courtesy of Terry Welsh, his great grandson. Henry Pickton (sometimes recorded as Picton) was born in the spring of 1881, just in time to be included in that year’s census. His parents, Gilbert Pickton and Emma Lavinia Messingham, both from Hampshire, had married three years earlier. Gilbert, a cowman, was born c1856 in Wotton, and Emma was born c1860, 24 miles away in Headley. When Henry was born, his parents were living in Surrey, at Tilford Reeds near the River Wey, not far from Farnham. Another son, George, was born in 1883, and a third, William, in 1887. By 1891 the family had moved to Wraysbury, possibly for Gilbert’s work, and were living at Windsor Road, a few miles from Gilbert’s younger brother, Edward, at Bedfont Village. Three more children were born in Wraysbury, Emily in 1893, Alice in 1897, and Albert in 1899. With their growing family, the Picktons moved from Windsor Road to a cottage near the church, just off Welley Road. The 1901 census shows Henry’s father and brothers all working on local farms – Gilbert as a cowman, 17-year-old George as a carter boy working with horses, and 14-year-old William as a labourer – but 20-year-old Henry had learned a trade and become a carpenter. Their mother, Emma, still had her hands full with the three younger children, Emily 8, Alice 4, and Albert, 1. Just two years later, in spring 1903, their father, Gilbert, died aged just 47. In October 1903, just a few months after his father’s death, Henry married Annie Mary Rawlings (1883-1961). Annie was a Datchet girl. Her father, John Rawlings (sometimes recorded as Rawlins), was a cowman like Gilbert. She came from a big family too, with three brothers, Robert, William and Albert, and two sisters Elizabeth and Bertha. Her mother, Sarah, a midwife, had been married previously and Annie also had two half-brothers, Thomas and Philip Avenell, and a half-sister Jesse Avenell. The Rawlings had been living at 16 Talbot Cottages, just off Workhouse Road (now Holmlea Road) not far from Home Farm at Datchet Common, but after the older children had left home, Annie’s parents, John and Sarah, had moved with the youngest two children and their niece to 2 Churchill Villas on Penn Road. (This would have been just behind where Zaman, the Indian restaurant, is now, formerly the site of The Rising Sun pub.) John and Sarah occupied four rooms at the cottage which they shared with Henry and Annie who had two rooms. By the time of the 1911 census, Henry and Annie had two children of their own, Annie Mary age 3 and Elsie May age 2, all living in the two rooms at 2 Churchill Villas. They went on to have another three children, Kathleen Mabel in 1912, Henry Gilbert in 1914, and Bertha Marjorie in October 1916. Although Henry was working as a carpenter, taking on repairs, and had a young family to look after, he was also one of Datchet’s firemen and was on the fire brigade committee. Henry and his brothers had very different experiences of war. William, had worked for a while at the paper mill in Wraysbury after their father’s death. The 1911 census shows he had moved back to Wraysbury with his mother and two youngest siblings, Alice and Albert. William enlisted in June 1915 and, probably because of his experience working with horses, he was assigned to the Remount Squadron of the Army Service Corps. He was based in the UK, helping with the provision of horses and mules for soldiers on the Western Front. His sign-up papers show his address as Perseverance Cottage, Wraysbury, his mother as his next of kin, his occupation as a groom, and his height as just 5’2½”. Brother George had married Sarah Newens in 1911. He was working at Home Farm, Datchet, when the war started. Eighteen farmhands had signed up leaving George as the only remaining ploughman/carter to look after 104 acres of arable land. Mr Kinross, the owner of Home Farm, applied for George’s exemption from military service. The 5th OBLI was in the 42nd Brigade of the 14th (Light) Division, part of the Third Army. It’s not yet known what date Henry finished his training and was sent to the Western Front but the 5th fought at the Somme in 1916 and was involved in the German retreat to the Hindenburg Line in March and April of 1917. 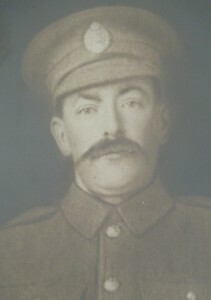 Henry was killed in action on 3 May 1917, age 35, during the Arras Offensive. The Light Bobs website has records for the 5th service battalion based on extracts from Regimental Chronicles. 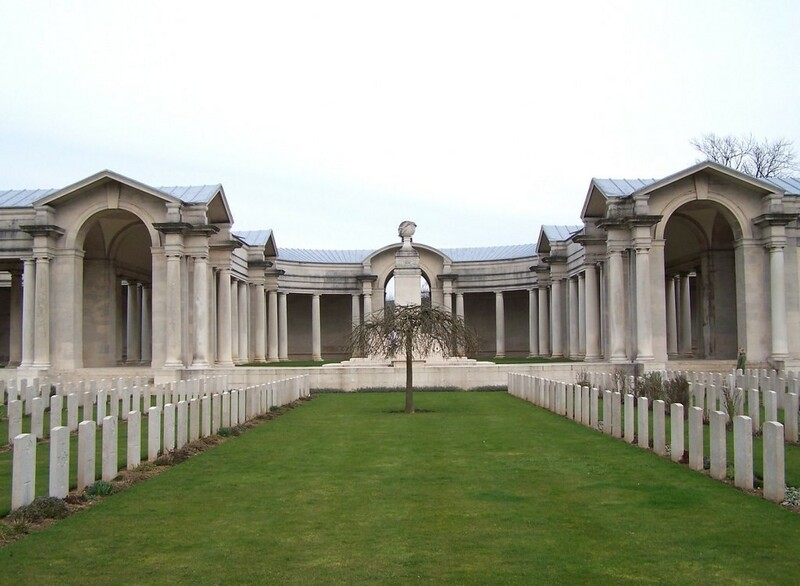 The section which covers July 1916 to June 1917 (please scroll down the page for the relevant text) includes details of the Attack on Hillside Work, at Vis-en-Artois, when Henry was killed. “At zero [zero hour, 3.45am 3 May 1917] the Battalion was formed up …/… The front line was on the taped line, the second line in Ape Trench. [The trenches were given zoological names.] The German artillery and machine-guns opened fire within three minutes of our barrage commencing; most of the artillery fire was between Ape and Bison. Until the advance commenced at zero plus 18 there were only a few casualties from artillery fire in Ape, and none in the companies in front. On the other hand, the machine-gun fire was very heavy and accurate. …/… At zero plus 18 the advance commenced and reached a line about 50 yards west of New Trench, beyond which it was found impossible to advance farther on the left. “On the right of the line 2nd Lieutenant Peel (A Company) found it possible to avoid the machine-gun fire by crawling, and he got a few men forward and occupied part of New Trench. As touch had been lost with the 8th Kings Royal Rifle Corps, Peel brought up the reserve platoon of A Company on his right flank, and gained touch with them. This was about 4.30 am. About this time the remainder of A Company and part of D Company managed to get into New Trench. “The Germans who had been holding New Trench retired to a line about 40 yards in rear, from which they heavily bombed and opened fire with two machine-guns on New Trench. These were, however, soon silenced by rifle and Lewis-gun fire. It was, however, found impossible to advance owing to the very accurate and unceasing machine-gun fire from the left, and also to a certain extent from the front. The artillery fire also became fairly heavy about this time. “The situation now was as follows: about 50 men of all companies in New Trench, and parties of B and D Companies (about two platoons in all) in a line of shell-holes about 40 yards behind. This party tried to consolidate, but found it impossible to work owing to the incessant machine-gun fire, snipers, and heavy Vane-bomb fire, which came from the left flank, probably from Hillside Work. “The situation remained unchanged until about 10.45am, New Trench being shelled continuously, while a very heavy barrage was maintained on the Assembly Trenches. “At about 10.45am the troops on our right were observed retiring, and a strong enemy counter-attack in 6 or 7 waves (each estimated by those in the front line at about 150 to 200 men) was launched against New Trench. Fire was immediately opened on them with all available rifles, Lewis-guns, and two Vickers which had come up, and many casualties were inflicted, but without stopping the counter-attack. When the enemy had got within 50 yards of New Trench, and our ammunition was practically all expended, the remnants withdrew to the Assembly Trenches, bringing back as many Lewis-guns as possible. The two Vickers had to be abandoned. “Owing to there being no room in the front Assembly Trenches, I rallied the Battalion in Buck Trench, where it remained until relieved. According to the Colonel’s report, more than half the battalion was killed or wounded, there were 291 casualties out of 523 men. The troops of the 5th OBLI had been involved in intensive training behind the lines as they prepared for the attack on 3 May 1917. A few days before the battle, they were moved firstly into Arras town, which was already packed with troops, then towards their forward positions, passing hundreds of artillery guns along the way. The troops halted a couple of miles outside Arras in a large hollow where the whole battalion remained for a few days. They were given lectures about warfare and advised to take the opportunity to write letters home. The day before the planned attack, they were ordered to pack their kit bags. They had a great coat and cap, tunic, trousers, boots, webbing and helmet, a rifle and bayonet. Each soldier was issued with 120 rounds of ammunition and a Mills bomb (hand grenade) in each pocket. The Colonel gave the soldiers his blessings, telling them not to stop until they reached Berlin and not to bother taking prisoners, then the final orders were issued. When it got dark, the 5th made its way up to the front line, about three-quarters of a mile away, passing through a steep railway cutting opposite the German line. The Germans often shelled the cutting but on this night all was quiet. They arrived in the trenches with the other regiments, all packed shoulder to shoulder. The men stood in the dark, many smoking but hardly anyone speaking. The officers walked past occasionally to check everyone was all right and in the early hours, the cooks passed round mugs of steaming-hot tea laced with rum. Ten minutes before Zero Hour, 3.45am, a heavy British barrage was due to commence. The soldiers fixed their bayonets in readiness but scarcely had the British barrage begun when the Germans opened up with their own barrage. Shells flew in all directions. Zero hour came and the men were ordered over the top. They started to advance into no man’s land but the smoke from the barrage made it difficult to see. Hawtin Mundy described it like “walking into a thunderstorm with lightning flashes all the time”. Bullets and shells were falling all around. Men started dropping straight away. The wounded tried to crawl back to the British lines but many were never seen again. Only a few made it to the German trenches. When the battle came to an end and the smoke began to clear, the bright morning sunshine revealed the devastation left behind, with scores of khaki-clad bodies littered across no man’s land. Henry’s family was initially informed that he was missing, presumably because his body had not been found. A month after his death, the Parish Magazine reported in June 1917 that Henry was believed wounded and missing: “Much sympathy will be felt for his young wife in her hour of suspense and anxiety,” it wrote. Henry’s great grandson, Terry Welsh, grandson of Henry’s daughter, Kathleen Mabel, writes: “The first a family would know of the death of a loved one was the arrival of a telegram from the War Office”. Henry left behind a widow and a young family of five, the youngest just six months old. 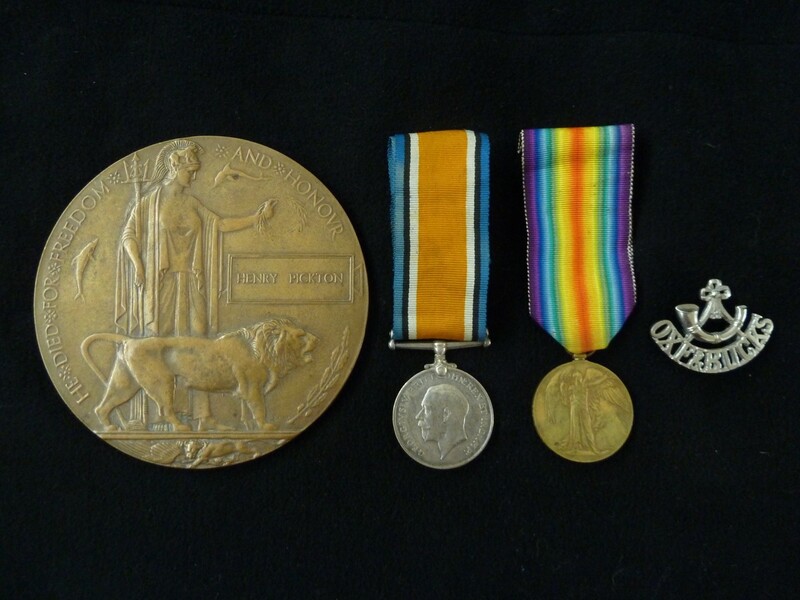 Terry Welsh’s photo shows the Death Plaque, medals and cap badge given to Henry’s wife, Annie. Henry’s mother Emma died in 1921, aged 62. Henry’s widow, Annie, died in the winter of 1961. 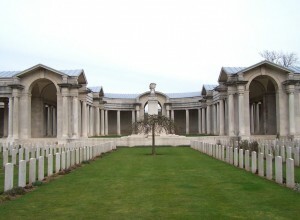 The Arras Memorial. Henry Pickton is remembered in Bays 6 and 7 which are either side of the central arch. I remember Annie Picton from Penn rd Datchet. my family were friends of the Pictons and I am given to understand that Annie used to assist ladies with the birth of children and was supposed to have delivered me into this world 85yrs ago. Thank you so much for adding that detail, Fred. We’re very keen to bring all these ‘jigsaw pieces’ of information together to create as full a picture as possible, not only about these men but also their families. Annie Pickton is my second great Aunt, I believe my great grandmother lived at 4 Churchill villas in 1949 at the time of her second husband’s death. (Leonard Wall). I wonder if Frederick Murray remembers any more of the Rawlings family.